In my family, the holidays have always meant a time for caroling parties, a competitive game of white elephant and most of all, homemade biscotti. Being away from home, I miss the smells of the biscotti baking and helping my dad shape the loaves. These cookies have a long history in my family that goes generations back, so the holiday season just isn’t complete without some of these delectable cookies. These cookies also have an interesting place in world history. Because they’re nonperishable and can be stored for a long time, they were used by Roman legions during wars and long journeys. So, once made, these cookies will last you long past New Year’s (if you don’t eat them all first!). This recipe requires some time and love, but it’s totally worth it. It traveled with my family all the way from Italy back in the 1880s and has been passed all the way down to me, so in turn I pass it to all of you. Buone feste! Grate complete peel of orange and set aside. Squeeze orange and retain all juice. Melt butter in a medium pan, making sure that the butter doesn’t brown. Remove from heat. Add beaten egg yolks, vanilla, orange zest, orange juice and almond extract. In large bowl, whisk flour, baking powder and salt together until thoroughly mixed. Pour liquid ingredients over flour mixture; texture will be very thick. Stir with wooden spoon and then knead between hands until dough is thoroughly mixed and does not stick to fingers. Add small amounts of flour if needed. Pat dough into two long shapes on large ungreased cookie sheet. Biscotti loaves should be roughly one thumb high and four fingers wide. Bake at 350 degrees Fahrenheit for 25-30 minutes. Loaves should be golden. Cool pans on wire rack. When loaves are cool enough to handle but still warm, slice biscotti with sharp bread knife. 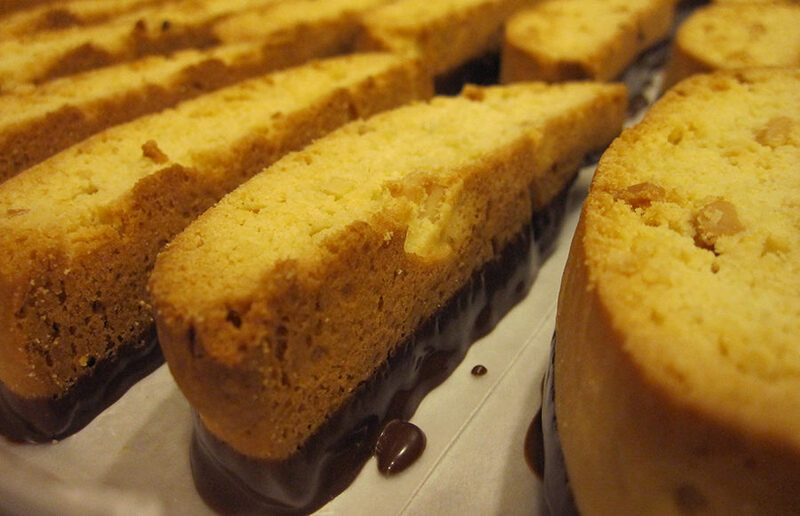 Biscotti can be sliced as desired; one inch is typical. Be careful not to crack during slicing by squeezing loaf slightly. Lay slices flat on cookie sheet and allow to cool completely. Heat oven to 375 degrees Fahrenheit. Lay slices flat on cookie sheet and toast on high oven rack for about 10 minutes until bottom side is deep golden brown. Remove from oven and carefully turn biscotti over and toast for five to seven minutes until bottom side is golden brown. Be careful not to burn. Remove from cookie sheet and cool on wire racks. Melt chocolate in double boiler over hot (not boiling) water. Add shortening and stir occasionally with wooden spoon until chocolate is melted, then remove from heat. Hold cooled cookie horizontally and dip one side in chocolate to cover bottom and sides. Place chocolate-dipped side on waxed paper. Repeat for remaining cookies. Cool until chocolate is set, which is normally 45 to 60 minutes. Store in an airtight container. The cookies store well and will retain their crispness and flavor for up to a month.